This work is part of the exhibition "Jun Yang - The Artist, The Work, and The Exhibition" at Kunsthaus Graz, Austria. Opening 14 February 2019. I was invited to create a display to feature the six volumes of "Monograph-Project, a project that I had worked on with the artist Jun Yang and the curator Barbara Steiner. 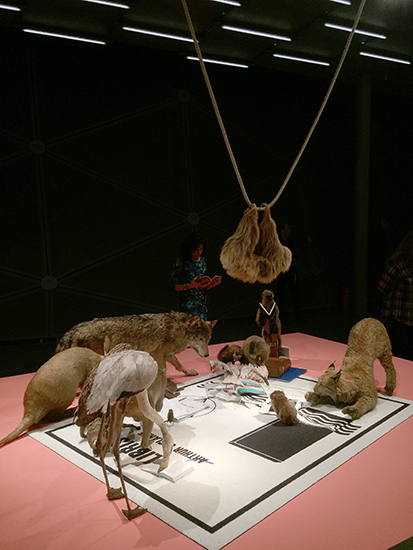 The installation features taxidermy animals in an anthropomorphized setting, a "Reading Group" on a carpet which depicts an enlarged Ex Libris by Arthur C Clarke. The animal dermoplasts are on loan from the Natural History Museum / Collections of Joanneum Graz.